Rose water is not only amazingly aromatic but also exceptionally versatile. It can be used in wide-ranging diy beauty products including facial toner, hair spray, cooling mist, and linen freshener. As the rose petals are edible, so rosewater has a place in the culinary world as well. As we cannot be sure how good the rose water bought off the shelves really is? Here’s an easy homemade rosewater recipe, explained step-by-step. All you need is just rose petals and distilled water to make your own pure rosewater. Did you know that its just as easy to make pure rosewater at home at an extremely low cost with its 100% purity intact? Read below to understand how to prepare pure rose water at home. There are two easy methods of preparing pure rose water at home. The one is to dip fresh rose petals in a jar filled with distilled water (available easily at chemist shops) and place them in the sun for some days. The other easiest and quickest method is by heating rose petals in distilled water in a clean covered utensil. Let it simmer until half the water is left, and then let it cool. Discard the petals and your scented, rose-colored pure rosewater is ready for use. I use the 2nd method, which results in a colored rosewater. I’ve been pleased with the outcome of this method so I continue to use this method. A third method, the distilling one, is quite time consuming and somewhat difficult. So we are not discussing that method here. (i) Rose Petals: Preferably fresh from an organic, pesticide-free source (or dried rose petals). Use 1/2 to 3/4 cup if you are using fresh petals (if using dried rose petals then about 1/4 cup). (i) Choosing Rose Petals: There are over a hundred different varieties of roses. The petals preferably should be freshly picked. You can buy roses but make sure they are from an organic source. 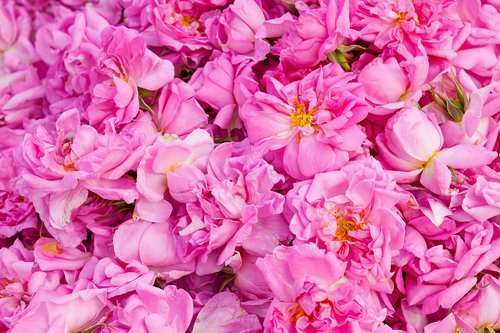 It is necessary to use pesticide-free rose petals so your rosewater is free of chemicals. That is why it makes sense to use roses that you have grown yourself. (ii) If you will be picking your own roses, do so early morning about 1 to 2 hours after sunrise when the morning dew has evaporated and the blossoms are the most fragrant. (iii) Use only petals, not the stem and leaves. Wash them thoroughly to remove germs and dirt particles. (iv) Place the rose petals in a saucepan or a large pot of distilled water. (v) Pour one and a half cup water into your saucepan. The water should be just enough to cover the petals. Too much water will make a very diluted rose water. (vi) Cover with a lid and let the mixture simmer on a very low temperature so that it remains steaming hot and not boiling hot. (vii) Allow the water to simmer until the color of the rose petals has faded and they have become almost colorless. You will see the water has taken on the color of the rose petals and rose oil floating on the surface. (viii) Leave the lid on and let the mixture cool completely. (ix) Pour the water and petals solution through the nut bag or cheesecloth into a dark, clean bottle. For convenience you can use a funnel or strain into a measuring bowl with a pour spout and then pour into your dark bottle. (x) Store the rosewater in a refrigerator for several weeks. It will last longer this way. Well when you prepare your own rose water, please share your experience with our readers under the comments section below. How can I print this without having to print pages & pages of stuff? Printer ribbon costs too much to print everything. Is there a book i can order instead with all the home-ade recipes recipes in it? How can I print just this recipe for rosewater? Printer ribbon cost too mcuh to print everything. Is there a book I can order with all the home-ade recipes in it? I don’t have print option for the posts on my site. However, you can email any article to your own email id or to any one else’s. You can see the mailing option in the left hand side bar. I dnt think i can get fresh rode petals.pls if i want to buy ROSE WATER which product will u recommend pls send me reply on my email address.